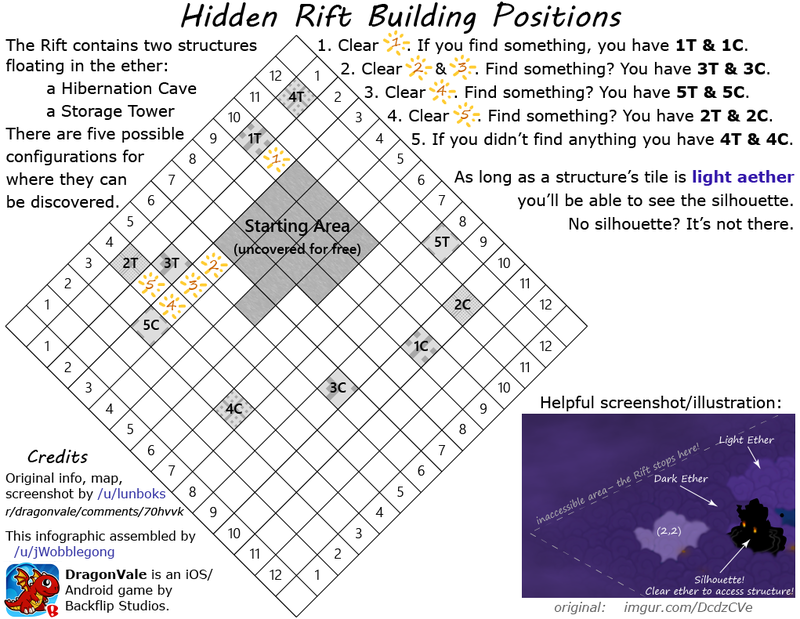 Thanks to your efforts during Roar of the Rift, the Rift has been stabilized for exploration! 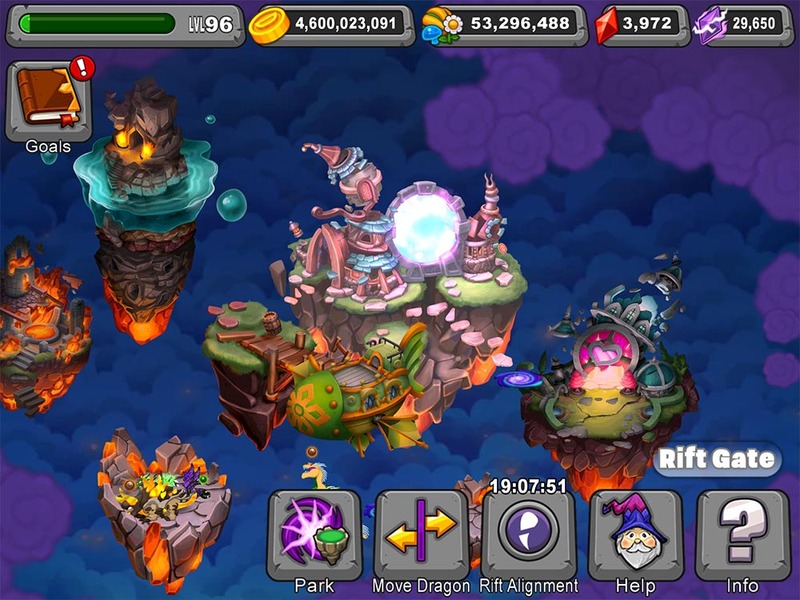 The Rift is another dimension of DragonVale! A remnant of the Cataclysm, the Rift unlocks at park level 28. Once unlocked players can travel to the Rift by using the Rift Gate. The Rift provides new opportunities for players to discover new dragons and explore an entirely new space! The Rift, and more specifically the Rift Breeding Cave, is the only place that dragons with the Rift element can be bred. The magic of the Etherium allows players to combine dragons in the Rift Breeding Cave and produce instantaneous results. Dragons with the Rift element will possess an elemental Trait which is inherited from its parents and from the Rift's own elemental Alignments. The Miasmic Ether of the Rift, a vestigial force of the Cataclysm, prevents exploration and development wherever it amasses. Fortunately, you can dispel Light Miasmic Ether using Etherium. Once the Ether is cleared, the unveiled area becomes a permanent part of your Riftspace, and previously adjacent Dark Miasmic Ether will turn to Light. Unfortunately, the magic of Etherium is not strong enough to directly dispel Dark Miasmic Ether. You will need to clear nearby Light Miasmic Ether first. From time to time you may even find buildings and special objects within the Miasmic Ether of the Rift. Within the Rift, the chaotic nature of magic causes the very elemental fabric of the Rift to change from day to day. This is referred to as the Rift's "Alignment." This Alignment has an effect on the breeding of dragons within the Rift, making it more likely that dragons with the current Rift's alignment result from breeds. Given enough Etherium, the Alignment of the Rift can be temporarily changed via the Rift Gate. The five great houses of DragonVale have joined in the effort to help discover the Rift. Once you've selected a House, your Airship will appear inside the Rift. Periodically, these Airships will have requests that can be completed in exchange for Etherium. Any dragons borrowed by your house will be returned after a short while. Traits are elemental expressions within individual dragon types. A dragon Trait is cloely tied to its appearance. All Rift dragons possess at least one Trait. Rift hybrids can have many different appearances, or "Traits." Traits are inherited from parent dragons or the Rift;s alignment. You can try experimenting with different Traits to see which combinations are possible on dragons, or by examining their information within the Dragonarium. Not all Traits can be applied to every Rift element dragon. Some dragons can only have one Trait. These dragons will only ever express this one Trait. Additionally, some dragons are not eligible for Rift elements or Traits at all. But the wizards and witches are discovering new Rift dragons all the time! Traits are unlocked per type of dragon. Foe example, if an Ash Dragon unlocks the Fire Trait, every Rift element Ash Dragon can have that Fire Trait applied to them. Once unlocked, dragon Traits can be changed at the Transfiguration Tower. If you do not possess a Transfiguration Tower, it can be found within the Miasmic Ether of the Rift. You can move dragons to and from the Rift using the Rift Gate. This building allows you to move a few dragons to and from the Rift at any given time. You can either place dragons into the Rift Gate, and they will move automatically to the other side. Alternatively, you can open the Rift Gate and select which dragons you wish to move. The new Rift dragons the easy, but not necessarily quickest way! 1) Your Rift must be aligned to Earth element to breed this. 2) Use Dark Rift + Alpenglow, or Light Rift + Voltaic. 3a) If you don't have Alpenglow/Voltaic, breed Dark/Light Rift with any other basic Rift dragon to get a Rift hybrid with a Dark/Light element. 3b) Breed the dragon you got in 3a with the other basic Light/Dark Rift dragon that you didn't use to get it. 1) Breed Dark Rift or Light Rift with Fire Rift to get a Watch/Dungeon/Heat/Ember dragon with a Fire Trait. 2) Breed the dragon you got in 1 with the other basic Light/Dark Rift dragon that you didn't use to get it. Breed literally anything with Water Rift, or any other Rift dragon with a Water trait. Can easily double up breeding for this with other dragons on this list. Breed literally anything with Air Rift, or any other Rift dragon with an Air trait. Can easily double up breeding for this with other dragons on this list. 1) Breed Fire Rift and Air Rift to get a Blazing/Smoke dragon with a Fire trait. 2) Breed Earth Rift and the Blazing/Smoke dragon with a Fire trait from step 1, to get a Dodo dragon with a Fire trait. 3) Breed Light Rift and Plant Rift to get a Meadow/Luminous dragon with a Light trait. 4) Breed Metal Rift and the Meadow/Luminous dragon with a Light trait from step 3, to get a Malachite dragon with a Light trait. 5) Breed the dragons bred in steps 2 and 4 together. 1) Breed Air Rift with Cold Rift to get a Snow/Blizzard dragon with an Air trait. 2) Breed Fire Rift and the Snow/Blizzard dragon with an Air trait from step 1, to get a Blue Fire dragon with an Air trait. 3) Breed Metal Rift and Water Rift to get a Rust/Quicksilver dragon with a Metal trait. 4) Breed Lightning Rift and the Rust/Quicksilver dragon with a Metal trait from step 3, to get a Plasma dragon with a Metal trait. THANK YOU MOST KINDLY, Arkynos ! Alpenglow: Light + Earth + Lightning trait. You'll need a Lightning trait Earth or Light hybrid. Lightning Rift and Earth/Light Rift will get you one that will work. Breed that with whichever of Light/Earth you didn't use to get it. Blightwing: Fire + Air + Dark trait. You'll need a Dark trait Fire or Air hybrid. Dark Rift and Fire/Air Rift will result in one within a few breeds. Breed that with the other element Rift dragon that you didn't use, as per Alpenglow. Snowsquall: Cold + Water + Cold trait. No fancy things needed here, Cold Rift + Water Rift will give you this. You may want to mix it up a bit though, you'll get a lot of repeat breeds if you just put those in until you get it. Just make sure you have both elements and the Cold trait accounted for between the two dragons. Voltaic: Dark + Lightning + Dark trait. Same as Snowsquall, Dark Rift + Lightning Rift works as a basic combo. Again, mix and match as you please while accounting for the elements. Actually, you can do that with all of the special Rifts bar Zaffer and Viridian I think. Spore: Plant + Metal + Plant trait. Opposite elements. You'll need a hybrid of Plant or Metal. Plant Rift and any Metal Hybrid is the easiest because the Plant Rift covers the needed trait, but a Plant trait Plant hybrid + Metal Rift is good too. You're a Wizard, Arkynos ! any earth and lightning rift elements, just one (minimum) needs to have a fire trait. You could use Rift fire quake or crystal, or just use them (or rift earth and rift lightning) during the rift alignment fire. Try light rift and miasma/howl, and dark rift and lotus/shimmer. Thanks SteelBluminati Confirmed! Magpac's Marvellous MagicMarker Memoryaide Matrix to Rifty Dragons You Have Bred! And here are those squares overlaid on a screenshot of a new Rift Park. The cost to upgrade a Rift Habitat, once you acquire it, does not increase. 14/40: 900 <- After buying this, upgrade all Reputable to Revitalised, 1100 on a Regular gets you +1 dragon, +35 cap, but upgrading a Reputable to Revitalised is 1000 and +1 dragon +35 cap. 17/40: 2000 <- After buying this, upgrade all Revitalised to Refined, 2500 on a Regular gets you +1 dragon, +30 cap, but upgrading a Revitalised to Refined is 2500 and +1 dragon +35 cap. 20/40: 4000 <- After buying this, upgrade all Refined to Regal, 5000 on a Regular gets you +1 dragon, +30 cap, but upgrading a Refined to Regal is 5000 and +1 dragon +65 cap. Note from mapgac: upgrading to Regals will require a fair bit more space, so more Miasma to clear. I don't know where the balance point is, where buying more Refined habitats become dearer than upgrading current Refineds to Regals, factoring in the extra clearing costs. But from here, I'm am just planning to buy Regulars and upgrade them straight to Regal. Since rolling with Tiamat/Bahamut will probably be important now, here's the average expected value of rolling for +1 on rift-types at various levels. Surprisingly, it's different from normal dragons. The winners are: level 17 if you do not use gems to add +1 to your roll, and level 19 otherwise. Don't mind the dust. The rift seems to have left some energy behind that caused some posts to vanish. Maybe they will reappear on the other side? So this morning before I started creating this post I moved my Level 20 Spore through the Rift Gate. After the 2 hour hold I bred it with the Level 10 Plant Rift they gave us in the tutorial. It gave me a mutant Metal dragon which I am now trying to move back to my original park. Moving dragons back and forth because you don't have space/habitat is definately going to be a bottleneck. Has anyone stumbled across anything of interest whilst unlocking a section of Light Miasmic Ether? We probably should try to keep track of where all the goodies are placed. Probably behind all the expensive pieces! Blazing Gale may have lost the magical essence gathering race but we are still the team in First. Still waiting for my mutant Metal dragon to move to my original park. We're going to need a bigger Rift Gate! Which when I click on the now lighter area at the bottom right of the black blotch, it says it can be cleared for 320, even though just before it was not clearable at all. Thanks for that! Based on the photo below from that FAQ page, I am trying to figure out where the Transfiguration Tower is so I can concentrate on clearing that area next. Also, it does not appear that we can visit the Rift portion of any of our friends' parks. If anyone figures out a way, post it here. When I visited SteelBluminati Confirmed 's park he has revealed 2 more habitats. Post a pic, sbf? I just visited as usual and tapped his Rift icon in the bottom of screen lineup. Took me right in. When you go to the Rift section of your park, click on 'MARKET' then 'HABITATS' and they will show up there if you have enough to buy them. They do not show up in the Market of your main park. Nessa, this is exactly what I am feeling, this extension is tailord to make money for BFS. Now you pay to breed, was 200 thinggy for first breeds, now it is already 1000 ! And you will need a LOT of breedings to get the required mixes of - for ex. Blue fire with air traight and then Plasma with metal straight in order to be able to breed Zaffer. Of course you will have piles of fails whch you can repatriate to your park but there too it is already crowded and your Hibernation place is getting full. I cut the music, can t stand it, and now even cutting the noises, can t sand it either. I think i will look in there from time to time, play with my park for a while and will slowly turn to other activities. Breeding is not the only thing that increases in cost with every use. Clearing the fog is the same thing. I went all around the edge of the open area tapping on fog groupings to check the cost. Thoroughly disappointed with BF today!!! This could change as the days go on but got a double whammy from BF today on both my DV &DVW games. So a little pessimistic right now but looking for the rainbows 🌈 ahead.